To maximise your chances of securing debt, equity or grants then you must create a compelling business case. This talk shares lots of knowledge on how to do exactly that. 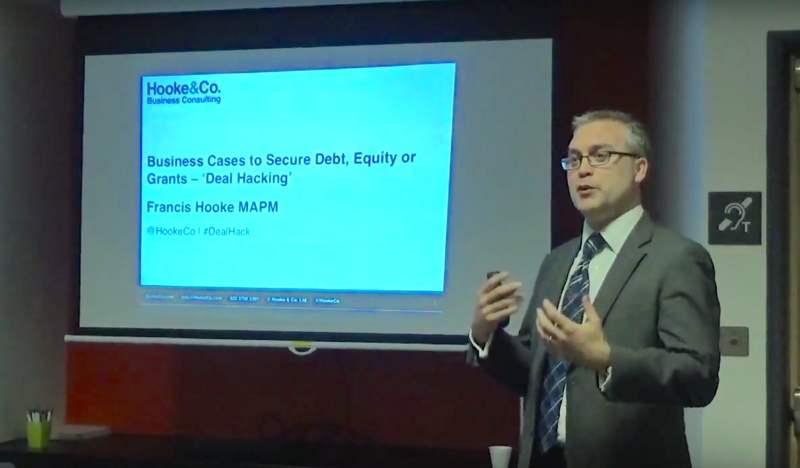 On Thursday 1st Oct 2015 Francis Hooke spoke at the SyncHerts Meetup at the Business and Technology Centre in Stevenage, Hertfordshire. This page includes a video of the talk and the corresponding slides. Links mentioned during the talk are listed below. After introducing the simple cost / benefit model, we mentioned how Seth Godin had applied this concept to the pricing of products and services. Seth Godin’s blog on costs, benefits and making sales. I suggested that decision making is driven by a mixture of rational and irrational / emotional factors. If a deal good, but for some reason it’s not progressing I said that a way to move forwards can be to ask yourself what emotional factors might be at play. A way to do this is to use The Taxonomy of Emotions. When discussing loans we talked about the pros and cons. Here is one successful entrepreneur with strong views on the subject. Mark Cuban and his views on using loans to start businesses. Whilst discussing grants I pointed to a useful government webpage that brings all types of support together into one directory. Government Finance and Support for businesses. GrowthAccelerator is a government-backed scheme to drive growth is small business with potential. Being part government funded it offers exceptional value for money. Francis Hooke is a registered and approved GrowthAccelerator Growth Coach. Here is our webpage on the service. Here is the the Business Growth Service’s page. I suggested that another scheme that businesses should try to take advantage of is Research and Development Tax Credits. This is for businesses that are pushing the boundaries of technological and scientific understanding – basically doing something new and innovative using science or technology. We work in partnership with an accounting firm to help clients secure this benefit.